M&L Technical Systems offers life and health insurance to full time employees who have been employed for a minimum of 90 days. Dependent coverage is also available for those eligible who choose to accept it. Employees can also choose to accept dental and vision insurance after 90 days of employment. We provide employees with workers’ compensation benefits beginning on the day of employment. It is our belief that safety is everyone’s responsibility. 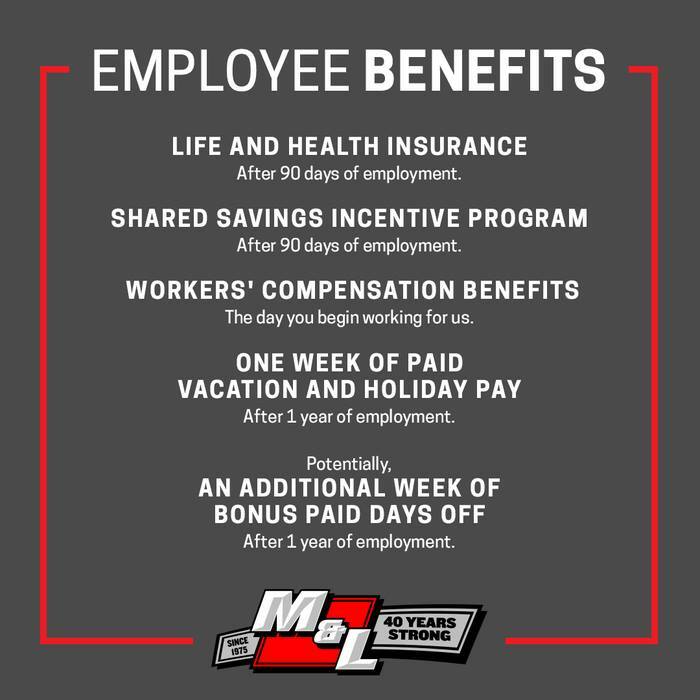 These benefits are paid by M&L Technical Systems and provide for partial lost wages and medical and hospital services for on-the-job injuries. All full time employees, after completing one year of service, are eligible for one week of paid vacation as well as holiday pay. Vacation is deemed as five working days for a total of 40 hours.